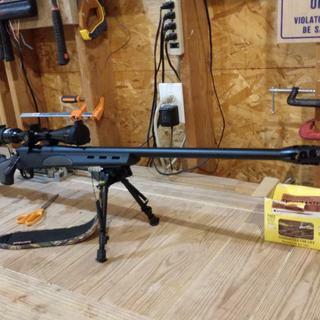 Well, mine is not threaded on the 7mm Rem. mag.. That is until next month when my local machinest gets back from his vacation then it will be . 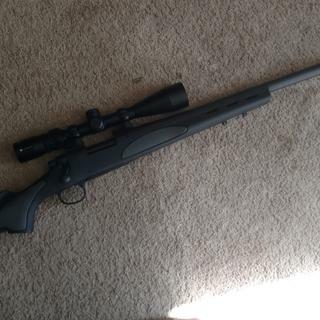 Very nice gun,accurate but no threaded barrel. No the barrel is not threaded. Does it use a magazine ? 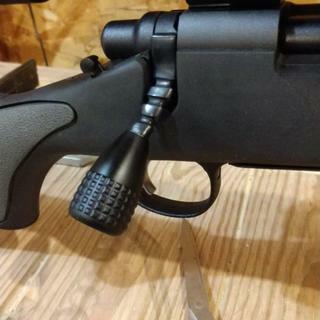 BEST ANSWER: No, This rifle is not magazine equipt, but you can purchase a Magpul Hunter 700 stock for about $250.00 and a magpul bolt action magazine well for about $65.00. If you're not sure, this rifle is a short action not long action, but none the less still well worth the buy. I hope this will help you in any way. No. It has an internal 4 round magazine loaded from the breach. You can convert it to a traditional magazine if you want. No, this particular rifle does not use a magazine. The bullets get inserted through the open bolt. Does NOT use a detachable mag. The magazine is internal and must be loaded through the top. With this stock, no. You can get stocks 3rd party that do. Great rifle though. Mine is in .308 and added a Choate tactical stock, Mueller 8-32x44 scope, shooting (stacking) Federal Premium Gold Medal 168gr Sierra Match Kings 3/8” at 100 yds. The factory stock is crap. Only way to keep it is to gouge out a whole bunch of plastic ribbing to free float the barrel. Toss it and spend $150-200 and you’ll have a sure nuff tack driver. Amazing how accurate these are with the Federal Premiums (friend has same rifle and his does the same with the Federals). It’s no fluke. I added many upgrades to this rifle. 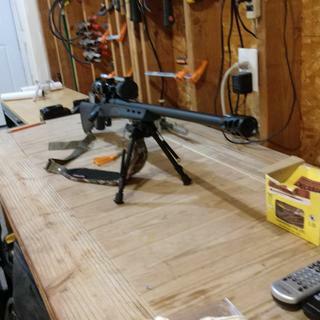 A precision arms muzzle break, glass bedding, bolt modification and a 6x25 50 Nikon BDC scope. The recoil is less than my .223 AR 15. MOE at 300 yds is less than 1/2". This is a thing of beauty and I only put in about $300 for the added features. This is the first time I've ever purchased a firearm from this company, and id on't think it will be the last. The price was THE BEST i could find anywhere, including all over the interwebs, and the shipping was super quick. I order the Firearm at about 12am Wednesday morning (don't ask) and it shipped by 9:42 AM the same day and made it from Texas to New Jersey by Tuesday the following week. Very impressed.As for the firearm, i am equally impressed, i have yet to take it to the range yet but i have good expectations from the gun. Whats also nice is this is a new model, made this year (2016) and does not require being sent back to Remington to have the trigger replaced. I will definitely be purchasing from this company again! This is an amazing rifle for the price. With some generic reloads and crappy rebate bullets I was able to obtain three quarter Moa with a five-shot grouping. Bolt-action. Legendary Model 700action. Heavy contour barrel. Ergonomically designed black SPSVarmint stock w/vented beavertail forend. Non-reflective matte blue. Hinged floorplate. Swivel studs. Drilled & tapped. Wt. : 8-1/2 lbs.